The morning after my tour of Scotland and the border counties was over, I didn’t fly home directly. Instead, I took the short flight from Edinburgh to Heathrow. I wanted to spend an afternoon in London–in particular, I wanted to go to Kew and finally visit the palace there. 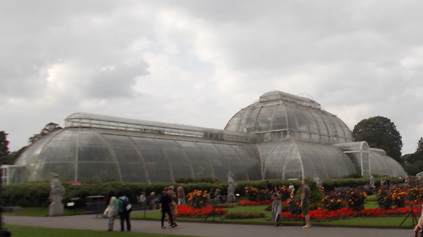 I’d been to Kew Gardens before, most recently with my mother when we went to the UK together about 7 years ago. That was on the day we arrived in London after the sleepless overnight flight and we never got as far as the palace; the hike to Queen Charlotte’s cottage completely did us in and I remember having to lie down for awhile in one of the vast Victorian greenhouses. Whenever I’ve been back in London since then, it was always too early or too late in the year and Kew Palace was closed for the season. But on this day I was out of the airport early enough in the afternoon that I was determined to go while I had the chance. It took only a few minutes to and check into the hotel in Chiswick and leave my bags in my room. I went out again immediately and took the Underground to Kew. It was only a few stops, about a 10-minute ride, and a short walk to the garden gates. The woman at the ticket kiosk assured me that the palace was open until 5 pm, and the gardens were open until 6. Plenty of time! I headed straight down the main path to the far side of the garden to go to the palace first. Kew Palace was a royal residence during the reign of George III. Most of the exhibits inside the palace are related to King George, Queen Charlotte, and their family. The first small room you enter contains a bust of George III. In a room on the ground floor, you can view portraits of the numerous royal children while listening to a woman’s voice (I think it was Helen Mirren’s) reading descriptions of each child from Queen Charlotte’s journals. Another room displays the architectural plans for the development and improvement of the building after the royal couple first obtained it, with King George’s notes. Another room contains objects of scientific interest, including the fanciest microscope I have ever seen. The dining room table was laid out for a meal in the French style–that is, with a number of dishes set all over the table at once like Thanksgiving, as opposed to the Russian style, with one course at a time that’s used more often in restaurants today. The food wasn’t real, but it took me some time to figure out what some of the items were. Meat pies and creamed spinach formed into little pyramids? OK. Baked apples. Also recognizable. But what were those roasted little animals that looked like prairie dogs? They must be rabbits. Eventually, I found a menu describing the dishes laid out. Yes, those were rabbits. The interior of the building is still in the process of being restored. Some of the rooms are richly decorated, while others are stripped to the bare timber. Sections revealing the original wallpaper or paint are left exposed. The guides in each room were dressed as footmen and waiting-women, although a few were also in modern clothes. At the very top in the attics where the servants’ quarters were, was a strange sort of exhibit where faint, ghostly figures were projected on the walls–as if you were seeing the 18th-century inhabitants of these rooms going about their usual business. I spent about an hour inside the palace, then explored the pretty little garden and herb garden in the back. Since there was still more than an hour before closing, I took my time making my way through the greenhouses and flower gardens of Kew back to the front gate.